Inexplicable Pain? Could It Be Caused By Interference Fields? Interference field is a local tissue irritation that can potentially cause destabilization of the autonomic nervous system. These fields are electrophysiologically unstable and emit abnormal neurological signs, causing the reaction of the autonomic nervous system. Scars, injuries, concussion can depolarize areas of the body creating an interference field. These scars could either be visible and external on the skin, or hidden on internal organs, teeth, autonomic ganglia. These areas are usually sensitive to toxins accumulation, and can block the energy flow of the nerve and meridian network of the body. This can reflect to a specific organ and may create otherwise inexplicable pain, or other issues. The symptoms though may appear in a remote area of the body, far away from the actual disturbance area. For example, an appendix surgical scar can be the source of unexplained migraines or headaches. Myoskeletical pain, asthma, angina, hormonal imbalances, irritable bowel syndrome, menstrual irregularities, urinary tract infections, heart palpitations, indigestion, constipation, are some of the consequences of interference fields. In fact, any symptom related to body function that is controlled by the autonomic nervous system, could be caused by an interference field. The treatment of interference fields is consisted by treating the affected tissue with neural therapy, mud packs, microcurrent therapy, essential oils, among other therapies used at Neomed Institute of Wellness and Rehabilitation, in order to restore the cell’s electrical potential, the physiology of the tissues, and the cell membrane stability. The effect of the treatment will occur within the first few days. The treatment should be repeated in order to achieve longer response, until is no longer required. Amongst all types of martial arts, Chinese Tai Chi is the one known to be practiced both for defense reasons and for its contribution to well-being. But what exactly is Tai Chi? Having existed as a traditional type of Chinese martial art, Tai Chi was developed over 800 years ago, and its practice combines physical activity, vital force empowerment, internal strength and respiratory training. The primary difference between Tai Chi and many other types of martial arts, is that this specific type does not require physical strength in order to be practiced; its philosophy, instead, focuses more or respiration, gentle and coordinated movement and internal force. This brings us to the indisputable benefit that Tai Chi can have on many types of chronic diseases. Once a topic of speculation and dispute, Tai Chi has nowadays been proven to have a confirmed positive impact on the physical condition, well-being and standard of living of patients suffering from chronic disease. A 2016 comprehensive study conducted by the British Journal of Sports Medicine reviewed 33 individual studies, and concluded that Tai Chi can be safely practiced by patients suffering from conditions such as heart failure, chronic obstructive pulmonary disease, cancer and osteoarthritis: not only is Tai Chi safe for these chronic sufferers, but it has actually been proven to improve their overall physical performance and reduce pain. Pain and physical restriction is known to negatively affect the standards of living in the case of many individuals affected by chronic illness. These patients cannot practice the usual type of exercise (e.g. aerobic exercise), which requires physical strain, strong joints and a competent respiratory and cardiovascular system. The effects of chronic pain and disease-related physical restriction are a huge burden, and result in medication over-prescription, melancholia and/or depression, as well as to a gradually declining physical condition. 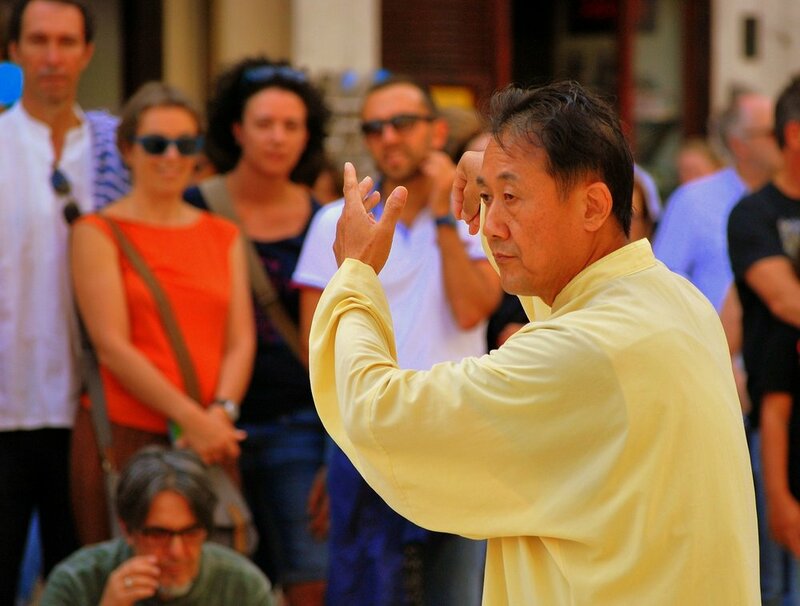 So how does Tai Chi exactly improve physical strength and well-being? A 2015 meta-analysis carried out by Ling Jun Kong et al., illustrates that Tai Chi, a type of martial art that focuses both on the body and mind, is practiced via slow movement and weight-shifting, rather than forceful and abrupt movements. This indicates that it can be executable by people with limited movement and can actually help to improve joint stability, by slowly setting the joint into motion. Tai Chi also focuses on meditative techniques; this type of cognitive stimulation and concentration exercise can also contribute to an elevated mood, a better immune system and also a better functioning autonomic nervous system. What patients are usually unaware of, is that chronic pain can cause physical complications, such as hypertension and insomnia: individuals suffering from chronic conditions can be heavily affected by such complications. Tis meta-analysis also confirms the positive contribution that Tai Chi can have on other conditions causing pain, such as fibromyalgia, chronic LBP (lower back pain) and rheumatoid arthritis. At Neomed, we are currently offering a Tai Chi program, suitable and focused on patients with chronic disease. Join and discover a whole new world of possibilities, including a better physical condition, positive energy and guaranteed rehabilitation.